If you're decorating your bathroom walls and considering wallpaper then take a look at these stylish bathroom wallpaper ideas for lots of inspiration. Posted By Alan, 19th Jul 2017. 6 Minute Read. Bathroom walls are a great opportunity to add style to the room, but rather than going with paint or tiles, why not consider the idea of bathroom wallpaper instead? Many of us feel unsure about using wallpaper in the bathroom as it seems totally logical to avoid using wallpaper in this room at all costs. This is because we tend to think of wet areas as a potential nightmare for wallpaper, but the wallpaper of today is made to endure the conditions of a typical bathroom, and as long as your room is well ventilated, there should be no problem whatsoever about using bathroom wallpaper. The only problem with bathroom wallpaper in fact is the huge amount of choice. So, we have decided to sift through all your options to find a great variety of wallpaper designs that will work perfectly in any bathroom. From modern, funky designs to classic, luxury patterns here are our 17 stylish bathroom wallpaper ideas. Take a look at these funky bathroom wallpaper ideas and we’re sure you’ll fall in love with them. Funky bathroom wallpaper designs add character and charm to almost any bathroom and really help to reflect your personality. 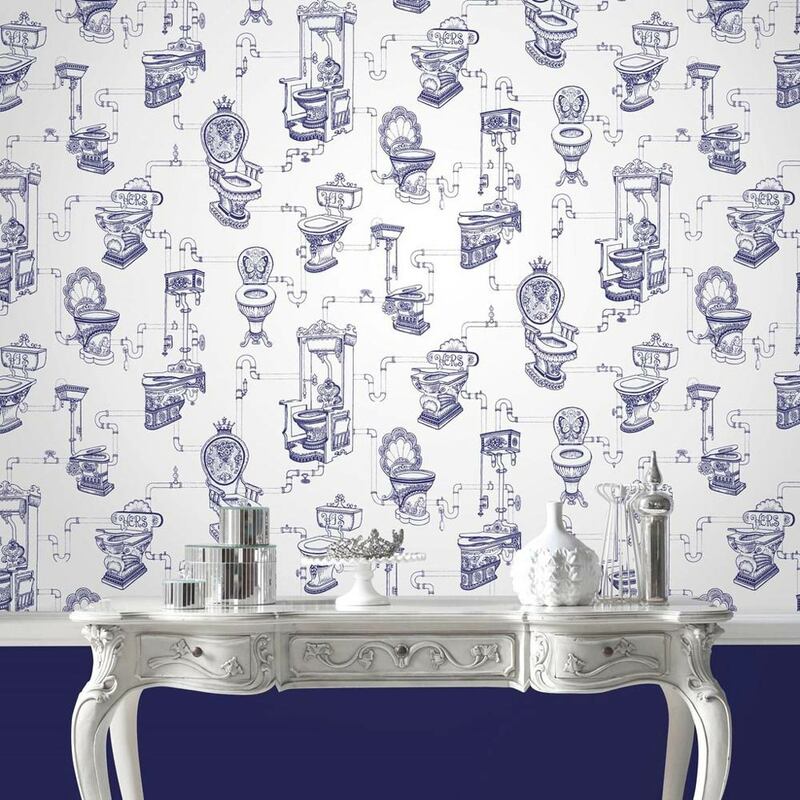 This funky bathroom wallpaper by Graham & Brown features lots of traditional toilets in a hand drawn design. Each one has tons of character and offers a humorous style yet retains a classy look. 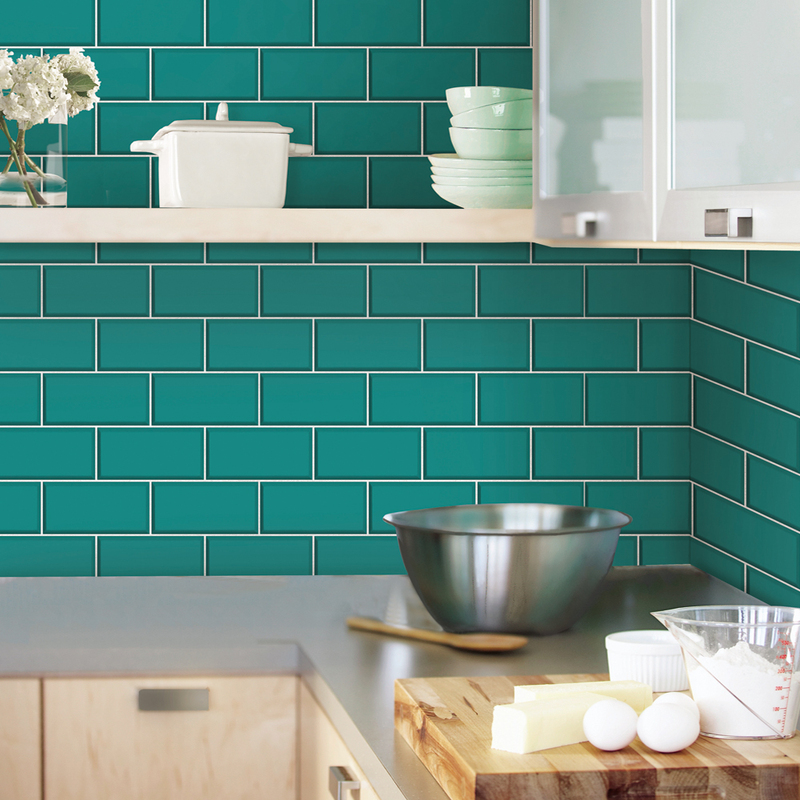 The surging popularity of metro tiles has even influenced bathroom wallpaper. 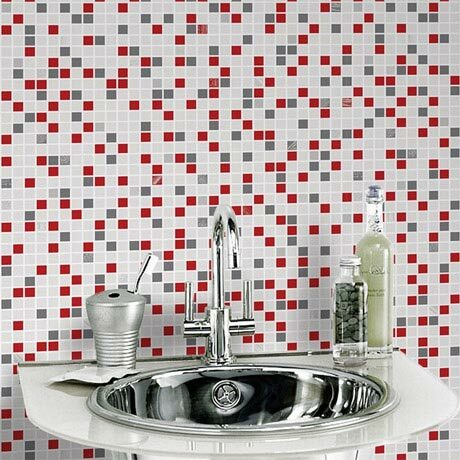 This metro tile style wallpaper is perfectly suited to bathrooms and is a really funky idea. 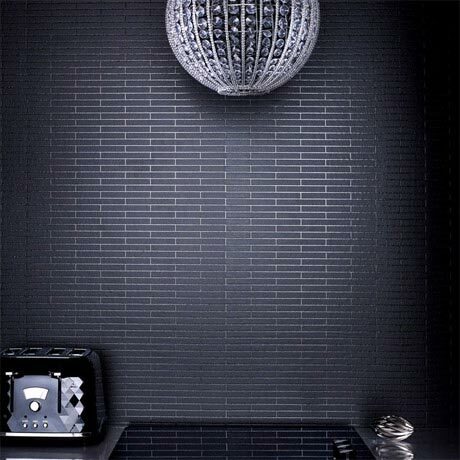 What’s more, bathroom wallpaper is much cheaper than tiles making this a great option for those who like to save money! Adding colour to your bathroom walls is a great idea. It brightens up the room and creates a dazzling look that can be a real head turner. This mosaic-style, checker bathroom wallpaper idea from Graham & Brown will create a funky feature wall or a help decorate a whole room. 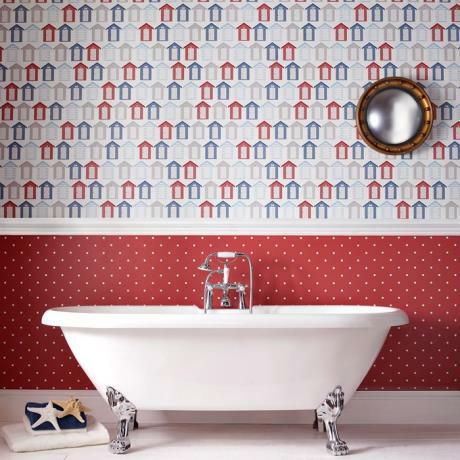 The nautical look in bathrooms has been a huge success in recent years and if you’re looking for a subtle seaside style then this funky bathroom wallpaper idea from Graham & Brown is ‘shore’ to win you over! It’s colourful and charming and has a neutral design making it ideal for both modern and traditional bathrooms. Monochrome and funky rarely share the same sentence but with this Geo bathroom wallpaper design from Graham & Brown, you get a stylish monochrome bathroom wallpaper with a totally funky gemoetric pattern design! The angles and tones create a striking effect making it a great idea for a feature wall in your bathroom. As you can see, there are loads of funky bathroom wallpaper ideas for you to choose from. They're great conversation starters and really allow you to show off your homes personality. Some bathroom wallpaper designs ooze luxury and whilst it’s not always important to have luxury wallpaper, you should choose a luxe wallpaper when you want to create an elegant and attractive look. The following mix of luxury bathroom wallpaper ideas will suit modern or traditional bathrooms, and in some cases, both. 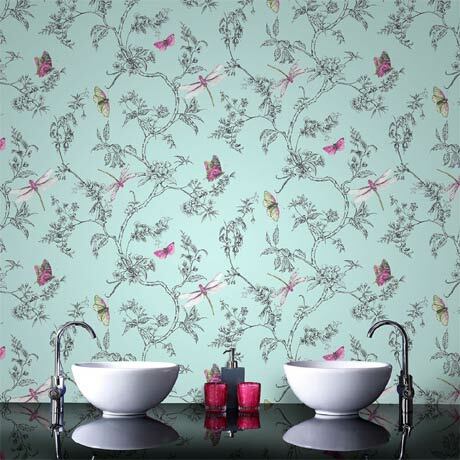 Bring outside in with this beautiful nature trail bathroom wallpaper from Graham & Brown. The stylish duck egg colour is complemented by pinks and yellows creating a luxury feel. A stunning luxury bathroom wallpaper idea especially for a feature wall. Perfect for a traditional monochrome bathroom style, this striking Pallade bathroom wallpaper by Graham & Brown will certainly cause a few jaws to drop. 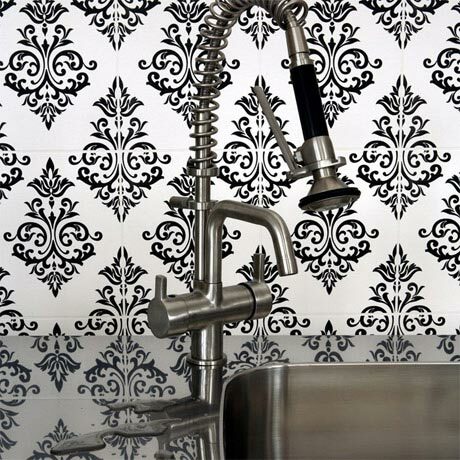 The motif pattern makes this an incredibly stylish bathroom wallpaper idea for a luxury bathroom. Ideal for both feature walls and full room decoration. 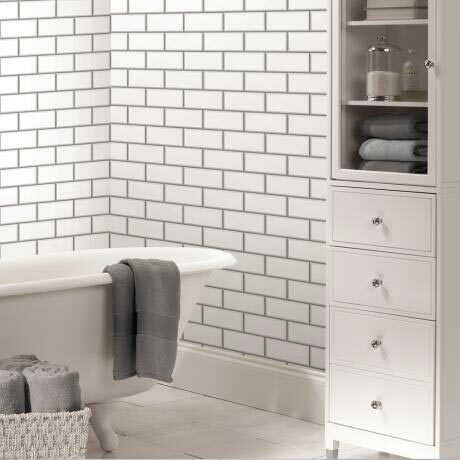 You can now achieve the luxurious effect of metro tiles with this stylish White Ceramica subway tile bathroom wallpaper from Fine Decor. Bathroom wallpaper costs far less than tiles which makes this bathroom wallpaper idea for those looking for a luxury look, but without the luxury price tag. Black bathroom wallpaper may sound a little bit off-putting as you’d generally prefer a bit of colour or light in such a room, but with luxury bathrooms black can actually add splendour and richness to the room. This luxury bathroom wallpaper idea from Graham & Brown would work beautifully as a feature wall or for decorating just the bottom or top half of the wall. Bathrooms are quickly becoming an attractive area of the home and these luxury bathroom wallpaper ideas will inspire you to create an elegant and majestic look in your bathroom. In many new homes bathroom space is limited so more and more homeowners are seeking small bathroom wallpaper ideas. When using bathroom wallpaper in a small bathroom, it’s important to ensure that you don’t make the room feel cramped. By using light colours and simple designs you can give a small room a more open feel. This slate tile style cream Ceramica bathroom wallpaper from Fine Decor is a great idea for small bathrooms because it’s light in colour. The slate style effect gives the impression of a large stack of tiles which also helps add height to the room which is a great small bathroom wallpaper idea. As we’ve mentioned previously, using light colours such as white, cream and light grey is perfect for small spaces. 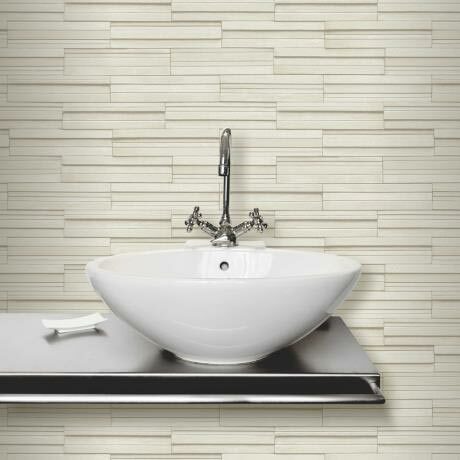 This makes the Matrix beige bathroom wallpaper by Holden Decor a great consideration for your small bathroom. 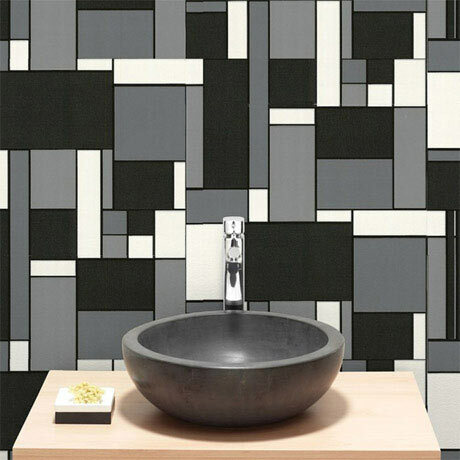 What’s great about this bathroom wallpaper is that it features a mosaic tile feature, which incorporates subtle coloured squares to provide a unique look and allow you to colour-coordinate with accessories in darker colours. Add a luxurious feel to a small bathroom with the Spa Shimmer bathroom wallpaper from Graham & Brown. This dazzling bathroom wallpaper idea is perfect for small bathrooms with its light colour. The shimmer style on the wallpaper helps to reflect the light which will also make the room appear larger than it really is. 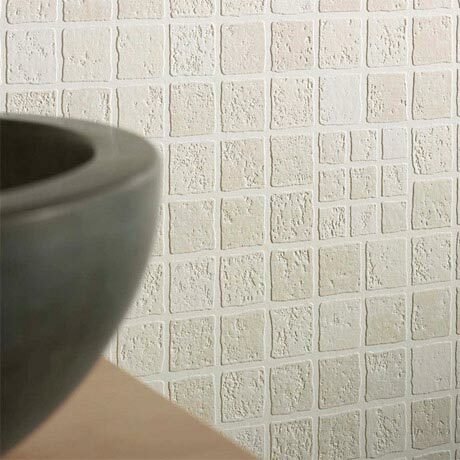 Mosaic tiles work perfectly in small bathrooms so this Earthen Cream bathroom wallpaper is worthy of your consideration. The mosaic style works beautifully in small spaces and the earthen cream allows the room to breathe. The colours vary from one tile to another to create a stylish and colourful pattern, but if you love attention to detail then you’ll really appreciate the subtle addition of 9 smaller tiles placed where there is normally just 4. Small bathrooms can really benefit from wallpaper. Keeping things light and keeping patterns simple can really have a great effect as these small bathroom wallpaper ideas prove. Using textures on walls has become even more popular this year. Textured bathroom wallpaper ideas range from brick effect, slate effect, wood effect and stone effect. These wonderful textures add a real charm to the room, but unlike real stone or brick which can be cold on the touch, textured bathroom wallpaper gives the same stylish look but keeps the room feeling warm. When you think of bricks, you’ll more than likely think of the traditional orange/red bricks. 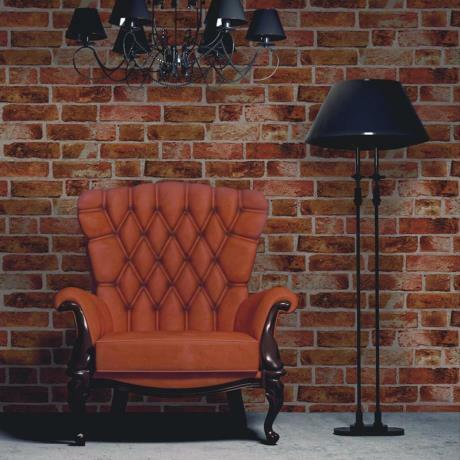 Fine Decor’s Distinctive Orange Brick bathroom wallpaper creates the perfect brick effect and comes complete with that authentic distressed look. This wallpaper can be used almost anywhere in the home but it is a fantastic bathroom wallpaper idea for medium to large bathrooms. Wood effect finishes in the bathroom have seen a recent rise in popularity, especially with the increased awareness of Scandi-bathrooms. This Distinctive Brown Wooden Plank bathroom wallpaper from Fine Decor creates a really stylish wood effect that would complement any natural style of bathroom. Textured bathroom wallpaper usually has a horizontal design so for a unique look cast your eyes on the Sahara Natural bathroom wallpaper design by Graham & Brown. 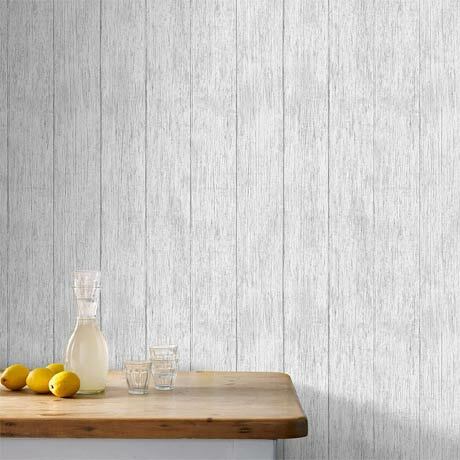 The vertically aligned wooden plank effect creates a cool, natural appearance and would look superb in any bathroom, especially smaller spaces which would benefit from the vertical design. If you're worried about the light colour and dirty marks, you'll be pleased to know that it's also easy washable - making it the ideal candidate for bathrooms. Just like slate effect tiles, slate effect bathroom wallpaper is really starting to break through. 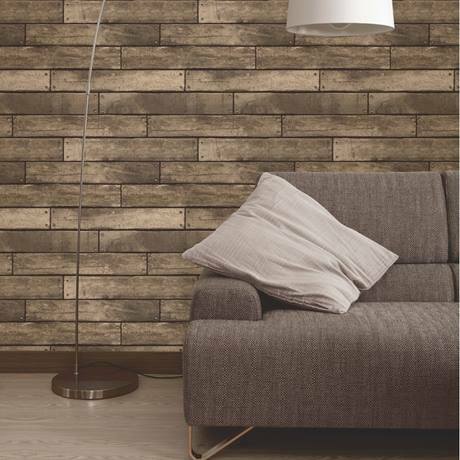 The rustic look of this Distinctive Multi-Coloured slate effect wallpaper by Fine Decor is great for a neutral bathroom with its earthy colours and texture. Textured bathroom wallpaper ideas like this tend to work well in medium to large rooms. 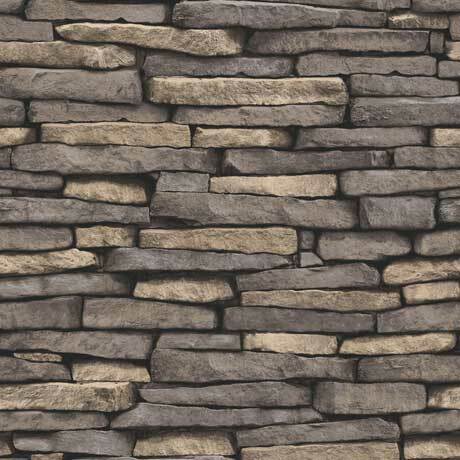 Textured walls are increasing in popularity all the time. Our textured bathroom wallpaper ideas will no doubt give you some creative spark when it comes to choosing the perfect design for your bathroom walls. When it comes to finding bathroom wallpaper ideas for your home, try not to be overwhelmed by options. Ask yourself, is my bathroom large or small? 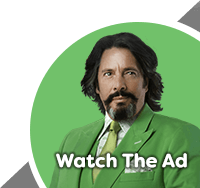 Do I want luxury designs or something with plenty of character? And finally, are you looking for a traditional wallpaper style or do you want one with a texture or effect? By asking yourself these simple questions you will be able to narrow down your search and have a much better idea of which bathroom wallpaper you need for your home. We really hope you found these bathroom wallpaper ideas useful and have found some inspiration here. If you did find the information here helpful please feel free to share this article with your friends or someone who you think may find it useful.